This is how a live album should sound: stark, powerful, no overdubs. "Ghost Riders" is a recording of Suicide's tenth-anniversary gig in 1981, and very nearly equals the primordial magic of their debut album (no mean feat). 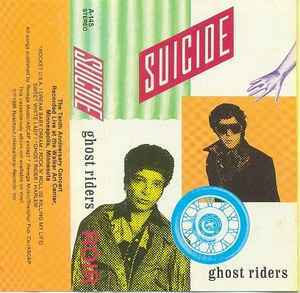 There are old favorites like 'Rocket USA' and 'Ghost Rider' as well as the nightmarish 'Sweet White Lady', during which Alan Vega overlays Martin Rev's eerie synth riff with disembodied screams that sound like they're coming from interstellar space. In addition to all that, you get the single greatest version of the pioneering punk duo's anthem 'Dream Baby Dream': rough-edged but tender, synthesizer and drum machine building to a throbbing crescendo, creating the aural impression of a huge, battered monument from an earlier age, still radiating light after thousands of years. You need this album. You're gonna be a Suicide fan, even if you don't know it yet!